I’m one of those folks who have more miniatures boxes than they have time to assemble. Time for hobbying is scant, unfortunately, but I always end up getting that next unit before I’m finished with my backlog. In some cases, this has led to the neglect of units for years. And it’s not just assembling them; many a time I’ve left a unit in some intermediate stage of painting for months, or even years. Such is the case with these Plaguebearers of Nurgle. 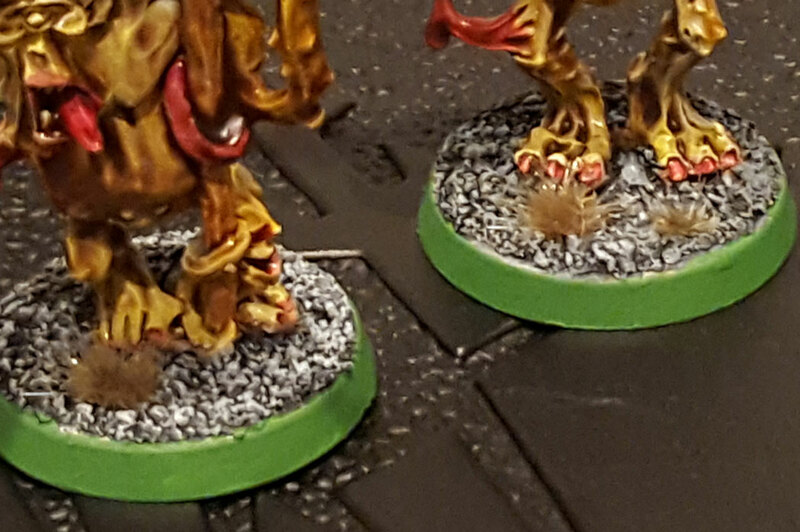 A completed unit of Plague Bearers, via the “dip” method. 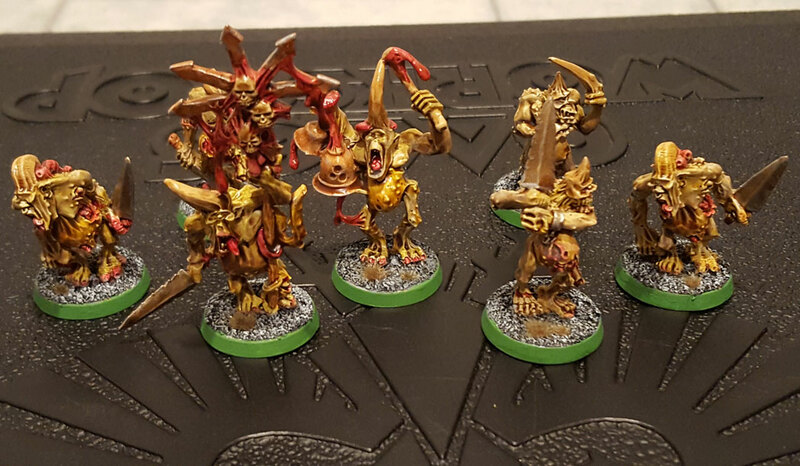 This unit was purchased not too long after GW brought out the five-model box of Plaguebearers, as I needed them for what I was sure to be a Daemon army. As such, I wanted them to be in the same style as my other Nurgle stuff, so I was planning to use the dip method. It was a great way to buzz through line troops when you were putting together an army. However, the models instead did a lot of extended sitting. First these guys sat with a primer coat. Then they sat for a time with just basecoats. Eventually, I got around to dipping them, and then they sat again. Finally, this past weekend, I put on a dry-brush layer of highlight and did basing, and now they are finished. I’m sure there are others out there who must do the same thing. But it’s funny, because in the course of this unit’s long journey, the dip method went from being cutting-edge to obsolescence. Well maybe not that bad, but with the new painting technology of the shades, dipping is just unnecessary now to quickly complete models. Still, I will probably use it on any other Nurgle stuff I do just to keep my units uniform. The one new thing I added to these models was some Citadel grass tufts. Previously, I’d used my own method of attaching static grass. I must say, I like the tufts, though I wish they came a little greener. There are still some resources out there if you want to learn more about the dipping technique. I was initially inspired to try the method by Big O, who used to post over at Bolter & Chainsword. Many of the links in that thread are now dead. But there are also discussion of the technique at DakkaDakka and Bell of Lost Souls. If you were building a Tyranid swarm or Ork horde, dipping was a good technique to use.